Baby rabbits are cute but they grow up fast. 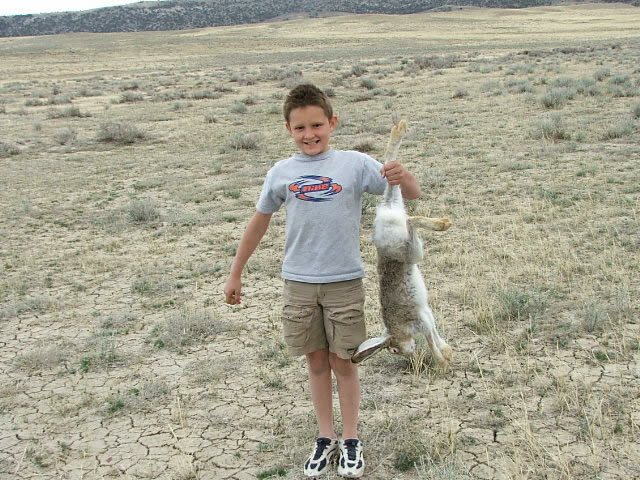 Rabbit populations grow quickly and all those babies grow up to cause a great deal of damage. 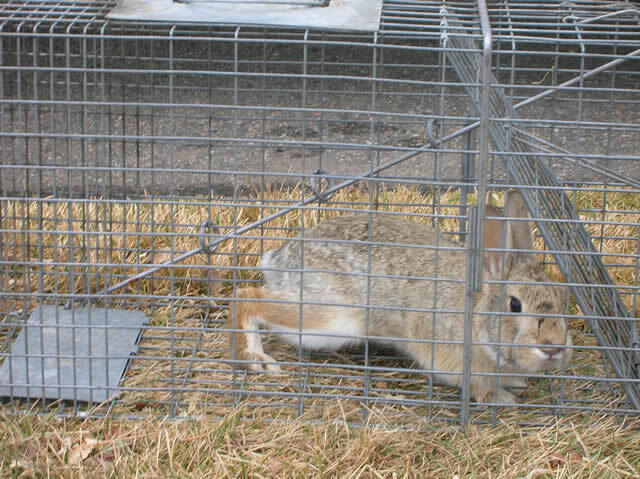 We use rabbit traps with appropriate rabbit bait to control wild critter populations. 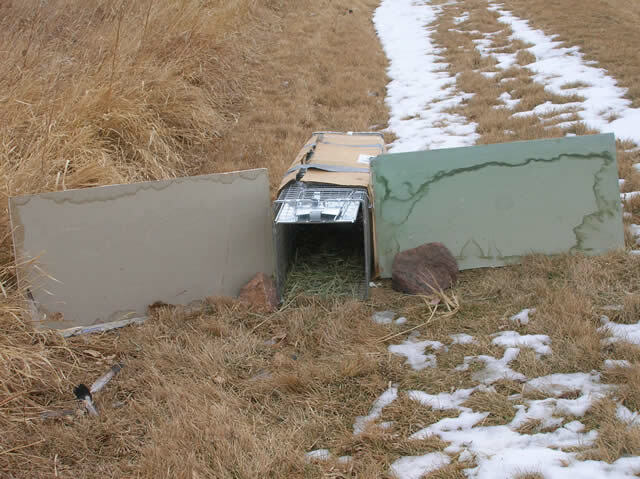 Our pro trappers know all there is to know about trapping rabbits. Want to get rid of nuisance rabbits in your area? Use our nationwide directory of wildlife control operators to locate a professional near you. Rabbits are cute, fuzzy, and generally gentle creatures. However, they can do a lot of damage to gardens, orchards, and crops. Garden plants. These animals eat a wide variety of flower and vegetable plants. They especially enjoy tulips, rosebushes, peas, beans, beets, corn, squash, cucumbers, peppers, tomatoes and potatoes. They also eat fruits and berries. Woody plants. In wintertime the soft, green plants are less available so they will gnaw on the bark of trees and shrubs instead. Apple, cheery, plum and nut trees are particularly vulnerable. As they eat they clip branches, twigs, stems, and buds. The wounds of the tree may attract insects, diseases, and organisms that lead to the death of the tree. Cane bushes. They eat cane plants such as blackberry bushes, raspberry bushes, and sugarcane. Spontaneous plants. Weeds, clover, and grasses are also acceptable food. To schedule an inspection, call Allstate Rabbit Control: 1-888-488-7720. In addition to plant damage, a common complaint is that there are rabbit burrows and holes left everywhere. 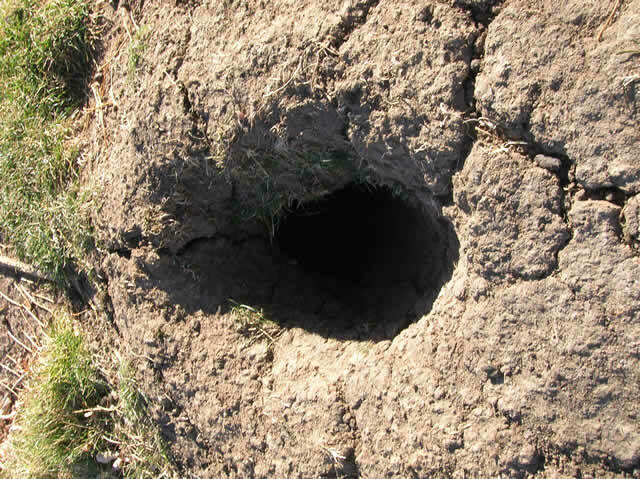 Most rabbits actually do not dig their own burrows, but rather occupy holes made by other animals such as woodchucks. They also live in naturally existing cavities such as those found in rock piles, and will build their own nest-like cavities out of weeds and grasses. They use these nests, called forms, to hide, stay dry, and raise baby rabbits. One way to make your property less attractive to these animals is keep it well-groomed. Shrubs and weeds that are frequently trimmed leave few places to hide. Also remove piles of stones or wood, thick bushes, brush, or anything else they might hide in or use as a den. They love debris because it provides safe places to hide, and they will likely stay where they feel the safest. How do I know if my plants are being eaten by rabbits? Clean cuts. Rabbit damage can be identified by the crisp, clean cuts they leave on leaves and foliage. Their sharp front teeth cut straight through without leaving any ragged edges. On woody plants, the cut will be at a 45º angle. If the chewing damage looks raggedy it is more likely caused by deer. Round droppings. Their droppings are distinctively round and have a coarse texture. Deer droppings, on the other hand, are oval shaped and smooth. Low to the ground. Rabbit damage generally occurs lower than 20”. Higher than that, it is probably deer damage. We are wildlife management professionals and can help you identify what your particular nuisance animals are. 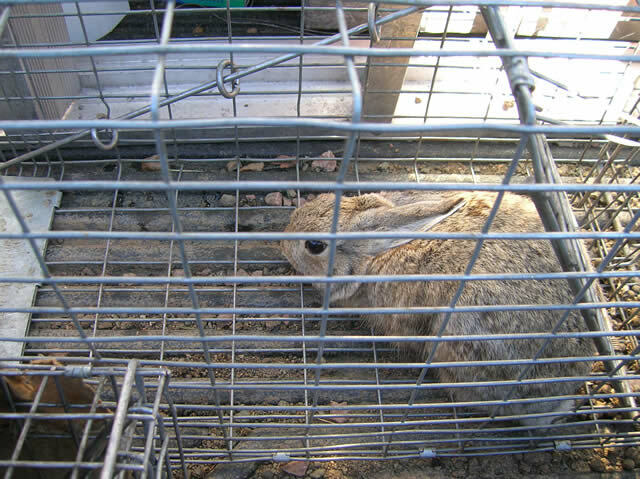 For this particular animal, our technicians use specialty rabbit traps and barriers. 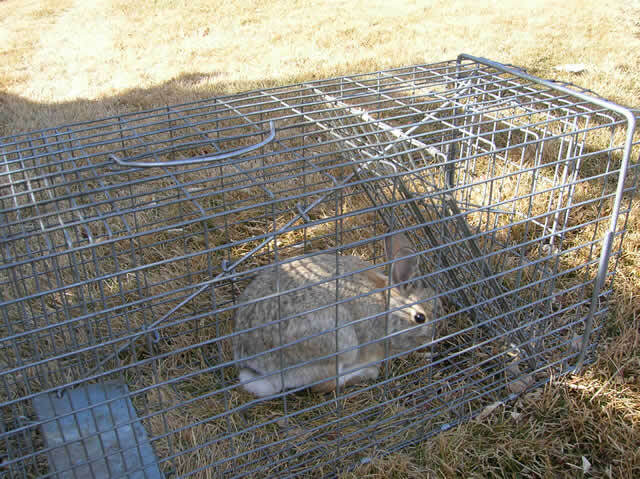 We do not typically use rabbit repellent, as trapping and excluding are more effective methods. 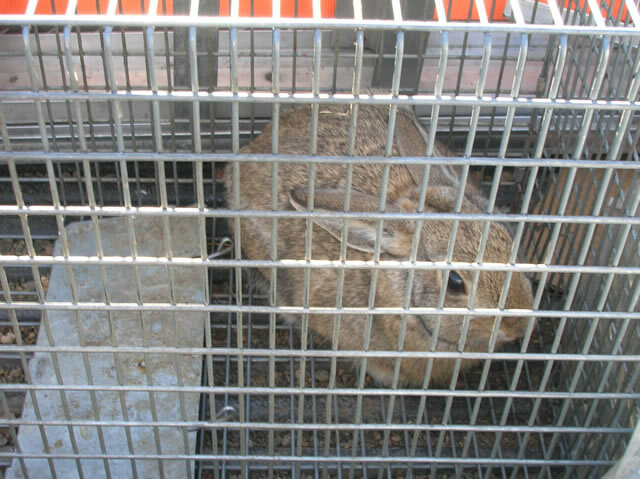 We can also install block-out materials to prevent them from accessing a specific location; these barriers are a very effective means of rabbit control. You may send us 5 to 10 digital pictures of your rabbit problem and we will give you a FREE cost estimate over the phone. Prices will vary depending on the severity of the problem and on the time spent on the job. Wild animals can be unpredictable; every job is unique and our solution will be custom fit to your situation. Check with your insurance for coverage. 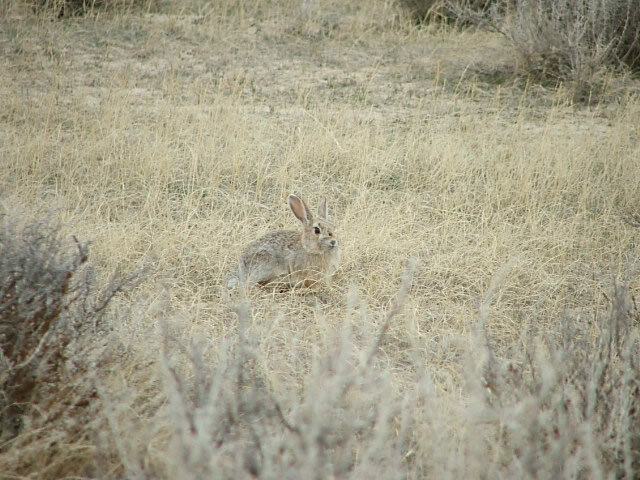 Read more about this pest animal at our Rabbit FAQ. We also offerexpert coaching services for a fee, so you can do the job yourself. We can even ship the necessary traps, lures, materials, etc. to you. We accept Visa and MasterCard. We also take purchase orders and cash. Rabbits are peaceful creatures, but rabbit control becomes necessary anywhere that they destroy gardens, landscaping, or crops in fields. 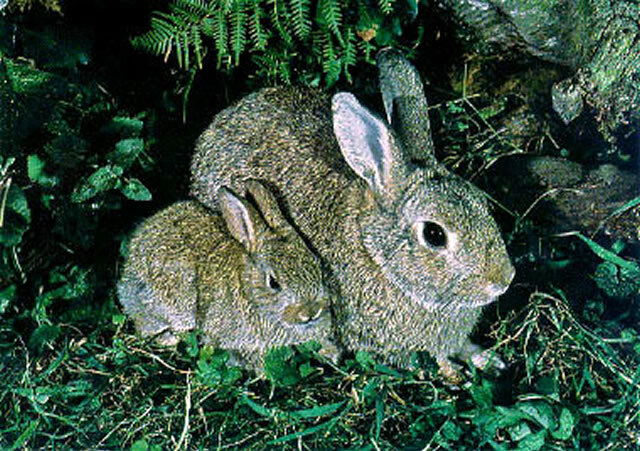 We can install rabbit repellents, or exclusion barriers, to prevent them from accessing your property. Rabbit holes and rabbit burrows make the ground uneven and are treacherous for the ankles of man and of beasts who may step in them. If you need to get rid of rabbits, give us a call. We offer complete pest wildlife solutions. Depending on the situation, we may be able to catch rabbits or sometimes we need to shoot them. 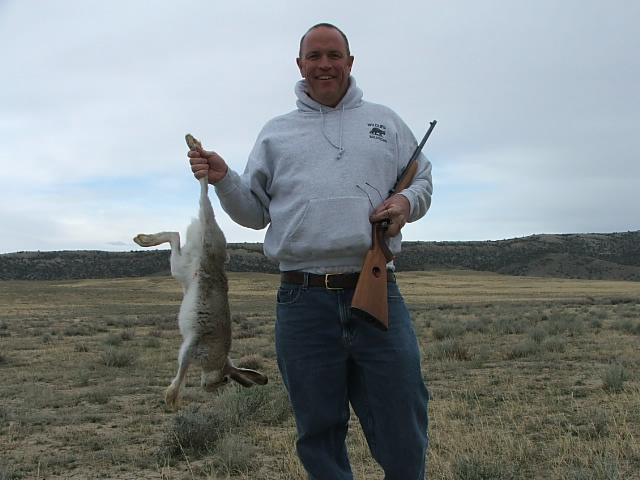 Catching rabbits is an important part of preserving property.